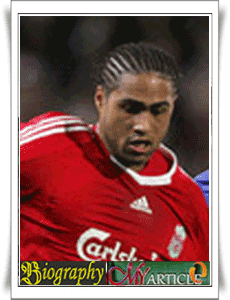 Glen McLeod Cooper Johnson or more commonly known as Glen Johnson is a professional football player who came from England. He was born on August 23, 1984 in Greenwich, London, England. Currently he is a retainer of clubs Liverpool and play at right-back. In addition, it also includes players in the England squad. Glen has played for several clubs, namely: West Ham United, Millwall (loan at West Ham United), Chelsea, Portsmouth (loaned Chelsea), Portsmouth, and this time for Liverpool. Glen has been played 15 times without scoring for the national team U-21 England for 3 years of his career since 2003. Meanwhile, for the senior national team, Glen has appeared 25 times and scored one goal. Glen was very pleased with the quality of the coach Brendan Rodgers. According to him, the new coach of Liverpool it would give a significant change in the style of play the Reds. Before meeting Rodgers at Liverpool, he also has worked as in Chelsea. At that time, Rodgers was an assistant coach Jose Mourinho.